We cataloged all of our reviews in a bunch of different categories. 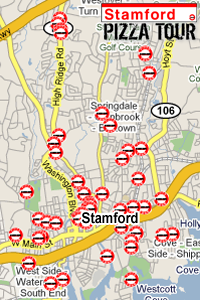 Among these many categories is a pizzeria's neighborhood, because if you live in the outer reaches of Stamford, even the best pizza on earth won't drag you across town. If you live in one of these neighborhoods and like another restaurant better than our certified Bests, then go there instead. We don't care.